First, many apologies for being totally absent from here for so long. It's been more than super-busy at work and home life. A few more gray hairs on my head since my last post. Not much extra time for ski talk. But, since I've been having some fun testing different skis over the past couple of weeks, I thought I really ought to share this with everyone here, and hope that someone finds it interesting and insightful. I've been demoing some skis lately to replace my '09 Supershape Speeds. Now, don't get me wrong....these are great skis, but they are 170 in length and thus a little on the short side for my height and weight (6'2", 220 lbs). I really would like something in the 175 to 180 length which will give me a longer platform for greater stability. I also find this version of the Speeds to have a pretty small sweet spot, and would prefer a ski on which I feel more balanced in tricky conditions (bumps, crud, broken snow....you get the picture....somethin g more forgiving, versatile, but that still performs at a high level). BTW, the second pair in my 2-ski quiver, the soft snow ski, is the Mythic Rider, 178cm, which has a huge sweet spot and has spoiled me by never making me feel off-kilter in any condition. Love those skis! Knowing how good that feels has made me seek out something better for my hard snow eastern groomer ski. This past weekend I was out west and got a couple of days in at Lake Louise, where I rented the Dynastars and clicked into my friend's Nordicas too. Conditions were refrozen corduroy in the morning; soft spring snow in the afternoon -- great to test the skis under a variety of snow conditions. Dynastar Contact 4x4, 178: Skied these for a full day at Louise. I had been warned by the shop guy that the 4x4s in this length would be heavy and cumbersome, and that the 172 would be better. Disregarding this advice with the reasoning that if this ski in this length were not suitable, then I would choose a different ski (I really do want a longer ski than 172), so I took them anyway. Well, the shop fellow was partly correct. At slow to moderate speeds, I found this ski to be exactly as he said it would be -- ponderous, demanding, heavy underfoot, grabby, lacking agility. Float over the soft afternoon snow was not as good as I expected it would be at those speeds, for a ski of that width. Edge grip was impressive, and they were very stable, had a big sweet spot and great fore-aft balance (just what I am looking for). On the other hand, at higher speeds they really came alive, and I got the energy, liveliness and power that I was missing at slower speeds. Wind 'em up, and they felt fantastic -- super stable, smooth running, quiet, amazing edge grip, blast through crud and soft mushy bumps without a twitch. Short, medium, long turns, they handled all with aplomb. They were surprisingly agile at speed, when I could get some muscle and power into the turn. In the end, though, these would not be right for me, as I don't want to rip at high speed all day long. I love to go fast, and do so frequently, but I also enjoy relaxing and just soaking up a great ski day with great scenery and fun people to ski with. I need a more versatile ski that I can be on all day with my kids and friends/family, some of whom just aren't that fast. At slow to moderate speeds, these are just too tiring and totally lacking in spark and energy (at least in this length). Dynastar Contact Cross Ti, 178: Also skied these for a full day (day 2) at Louise. I have read some good reviews on these in the print and online press, as well as some positive words here, and I was really looking forward to trying them, expecting a lighter, less-demanding, more agile version of the 4x4s. Well, they were pretty much as advertised. Edge grip was impressive, agility and quickness was very good at all speeds, short to long turns were all handled well, they were smooth and quiet, lighter underfoot than the 4x4s, big sweet spot and great fore-aft balance (really hard to get into the back seat on these, and on the 4x4s too). I also found these to be very stable, except at higher speeds when they started to get somewhat unsettled and shaky, but not enough to be unnerving. We got a few centimeters of fresh snow that afternoon, which got pushed around in spots by the boarders, and the skis just floated over it or blew through it without complaint. Nice. I was on them all day and still had plenty of gas left in my tank -- not bad considering I skied longer and harder than the previous day on the 4x4s. The only negative things I would say about these is there was that slight lack of stability at speed, and that they were missing a bit of the spark and energy that I look for in a fun ski. If I were lighter in weight, these faults would probably disappear and I would likely have found them to be excellent all-around. I guess I like the typical Dynastar feel that I read about here -- smooth, stable, damp-but-not-lifeless, even flex, good energy but not overpowering. A very good ski, all things considered. Would be an excellent and very fun ski for someone lighter than me. Nordica Speedmachine Mach 3, 178: These belong to a friend with whom I skied on Day 2 at Louise, and who just happens to have the same BSL as I do (ain't it nice when that works out?). Note: these are not the Mach 3 Power, which have metal in the layup; they are the Mach 3 carbon, non-metal. We swapped skis for a couple of runs, so I only got a very brief impression of the feel of these. By this time it was afternoon softer snow, with the few centimeters of fresh on top. Based on the two (albeit long) runs, I was very impressed. These felt very similar to the Contact Cross -- smooth, damp but not dead, stable, unshakable in crud, light underfoot, agile, short turns required more input, but medium and long turns were effortless. They tracked perfectly through the bumped up afternoon snow, and never got deflected. These had a super smooth silky feel to them that could get totally addictive. Good energy, but not jittery or demanding. I could see myself having a lot of fun on these. They didn't feel too soft for my weight, even without any metal, and held a high speed edge without problem and without losing any stability. I might rent these next time I go out there again, and get a full day on them to really get to know them (I will update here if I do). Fisher Progressor 9+, 175: I demoed these for 2 hours at Bristol Mtn. near Rochester (gee, I wonder who lives there....? ) a couple of weeks ago. No lift lines meant I could get a lot of runs in. Conditions were soft spring snow, but still firm enough in the early to mid-morning for good carving and high speed cruising. In short....WOW! These are excellent skis. So versatile. Short turns were a cinch -- just pressure the tips a bit and whoosh, 'round they came. Long series of snappy short turns on narrow trails were a breeze and a real hoot -- big grins. No less impressive were big high speed GS turns on wide runs. No inclination to make you want to turn all the time, they could run straight with ease. These seem to have no speed limit -- totally stable, smooth and unflappable at scary-fast velocities. Excellent edge grip; could easily vary the turn shape in mid-turn; and tracked perfectly through soft mounds and crud without deflection. They had surprisingly good float through the soft spring snow -- no issues with trenching or grabby edges (interestingly, I asked the shop about their tune, and they said it was 1 base, 2 side -- just the way I like it). Light feeling underfoot, yet stable; big sweet spot, never felt off-balance; great energy and rebound. I could relax on these too, and did not have to be on top of them at all times like on the 4x4s. Could probably ski these all day, fast or slow, and not feel thrashed. Compared to the Nordicas and both Dynastars, these were much more lively and less damp. Not to the point of being nervous or jittery, just more "alive", if you know what I mean....more feedback from the snow; felt like a more direct connection with the snow. An interesting sensation, and one that I am not used to, coming off the smooth-running Supershapes and Mythics, and I rather liked it. Overall, totally impressive...an outstanding ski. Big "Fun-Factor", and ain't that what this sport is all about? Summary: for my tastes, skiing style and needs, the Fishers were clearly superior. They had the best edge grip, great stability, and were the most versatile in terms of turn shape, as well as fast or slow skiing, and being able to relax one minute and just letting 'em fly the next. Next Steps: if possible, I would like to demo the Nordica Spitfires and compare them to the Progressors. They have a similar sidecut -- dual radius, and high performance construction. And Gary is just SO insistent on my trying some skis in the 78mm waist size, that I'd never hear the end of it if I didn't. So, like a dutiful pal, I will concede. What we don't do for our friends, eh? I'll be back working near Banff again in a few weeks (they have a long season there, esp. at Sunshine Mtn.) and near Fernie, BC too and there are shops that have the Peak 78 and the Nordica Nitrous (also 78mm, and getting top reviews). Season's not quite over yet for me! Welcome back Svend....it's been too long! Great reviews and so glad you were able to test some great skis. I should be noted that is a rather largish Viking.....so his weight does has an impact on how these skis perform...having skied with him....I know he loves speed. AND you just mark my words.....gotta try those 78's underfoot....anybra nd, pick a brand and see what you think...There's so much great gear out there that love to turn AND Crush on all sorts of surfaces. Look forward to your next review. Nice reviews. Thanks, and well done. Regarding the 78mm waisted ski, seems like that would be a lot of overlap with your Mythics, unless you are moving to a three ski quiver (or does Gary have 4 now). However I have to confess that I didn't actually check out the waist widths of the skis you demoed, merely assumed that they were all in the 68-72 range. It seems that Peter's review of the Contact 4x4 would pretty much agree with yours. One of Dynastar's most versatile skis and one of the best 1-ski-quivers on any mountain short of the Chugach. Virtuoso all mountain carver: powerful, silky smooth, stable, agile, predictable and, for all that, easy to ski?for strong skilled skiers. Svend, I love the Fischer Progressor 9's. They are great skis and so much fun to be on. You can't go wrong wuth those. Hey Gary, full disclosure was made in paragraph 2 in my first post Would you be wanting my chest, waist and hip measurements too? Actually, Gary's is a very valid point, as a person's height and weight play so much of a role in how a ski behaves beneath them, how much they can bend the ski, how much it twists, etc. 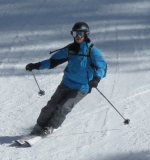 Because of my weight, I can readily get a rather stiff ski to become very compliant and easy to manage, even with my limited skill and experience. This, of course, leads into Jim's point about the 4x4's being good for a strong and skilled skier -- I'm strong, but not terribly skilled. They were great to ski on when I cranked up the power and speed -- stable, quiet, tracked where I pointed them, great short and long turns.....fantastic and a blast to ride. But for casual cruising, which I also really enjoy and do about as much of as cranking up the speed, these were one of my least favorite skis I've ever been on (their poor rental-shop tune surely played a role too, albeit minor, in my impressions). I need something more versatile -- great for speed and for relaxed loping. John, I think the Progessors will fill that requirement just perfectly. I found them to be incredibly versatile. Unbelievable stability and composure at speed, and yet I could dipsy-doodle around on those and get playful without having to force them to do what I wanted. BTW, I read your comment on the Icon TT80 and their easy release of the tail at the end of a turn -- I found the Progressors to be much the same. So pleasant and effortless to turn. All things considered, these were easily the best and most fun skis I have ever tried. Unless something by Nordica or Head really blows me away, I am pretty sure I will be buying these. Jim, you are right, all the skis were 70 to 75 in the waist -- Contact Cross 72mm; Contact 4x4 75mm; Mach 3 70mm; Progressor 9 70mm. Considering the Mythics are 88 in the waist, this is the size range I have been focussing on as my second (and only other) pair. (not building a 3-ski quiver, and I do believe Gary is down to only 2 pairs....for the time being.....) I will try the 78's and see how they perform. The Progressors will be tough to knock off the podium, though. Agreed on the tail. Releases instantly. That's why I skied the Progressors and hadn't skied my Super Shapes much at all. John, you are familiar with both the Progressor and the Icon 80....how would you compare the two? Are there any qualities that the Icon has that would recommend it over the Progressor? Having skied the latter, the only thing I can possibly think of that would improve that ski is a quieter, more silky-smooth running character.? But honestly, that seems to be gilding the lilly, as it such a good ski.? I'll accept a bit of liveliness in compromise to all the other good qualities. Is the Icon worth a look, in your opinion? As a side comment, I was pleasantly surprised at how well the Progressors handled soft snow, crud and tracked out snow (pushed around soft clumps).? They just sailed clean through with nary a hiccup, whereas my Supershapes would have been far more work to keep them stable and on course.? That quality alone makes me question the need for a wider ski, knowing that I have the Mythics in the quiver when I really need some float. BTW, the Icon 80 is getting rave reviews in the German/Swiss/Austrian media and forums.? I speak German, and have been checking out their reviews and forum posts.? Nothing but very positive words over there.? Ski Canada magazine also gave it a great review.? But I have yet to see a single pair on the slopes here on this continent. Spending the time and effort really pays off. Gary, for the frontside, the Progressor 9 is the best ski I have ever been on. Granted, my experience is limited to about a twelve to fifteen different skis, but I think that by this point I am able to pick up on a lot of subtleties between different models. It's going to take a pretty exceptional ski to knock this one out of no. 1 spot. I loved it. Ok so Svend got some Progressors being delivered shortly and he's been so happy, he's been (as all Vikings do) cow squats with Farmer Jones favorite milker, Bessy! He's getting ready for one more fling with the Canadian Rockies. Sounds like there may be some SuperShapes for sale?? It's amazing the lengths some people will go to just to ski faster than their wife.
? It's amazing the lengths some people will go to just to ski faster than their wife.? ? Yes....exactly 5 cm in extra length!? That oughta do the trick.? ? She won't know what's coming up behind her....the flying Viking? I will unashamedly admit that I need every advantage I can get.? Terryl is not a lazy cruiser.? ? And again Yes....my Supershapes will be for sale.? ?I will post a little note here with some pics and specs very soon. Cow squats? Say what? Is that one 'o them-thar newfangled isometric workouts, Gary? Not even sure the Vikings had cows. Probably had domesticated walruses. My fling in the Rockies will be without the eagerly-anticipated Progressors, unfortunately. I am going west for some project work, and have enough gear and luggage to schlep without lugging a ski bag along too. Will rent some cool skis, though.....Peak 78, and Nordica Nitrous. Should be fun, and I will post reviews here.